My Zero Tolerance 0300 got a lot of looks when I carried it around. At over 9″ long and with a weight of 8.6 ounces, it definitely raised some eyebrows. The excellent S30V blade was a force to be reckoned with, and I really enjoyed the loud “thwack” of the assisted opening. It was generally a really cool knife to carry, but lets be real, it’s not always practical to tote around such a beast of a blade every day. After a while a knife of that size (and weight!) might get pushed to the back of your EDC rotation, to eventually fall off into a dark corner of your knife collection. So the good folks over at Zero Tolerance decided to tone things down a little and offer a slightly tamer, yet no less cool version of the original 0300; the Zero Tolerance 0350. This little brother packs many of the great features that made me fall in love with the 0300, but comes in a size that is much more practical for many people to EDC (although it’s still a big knife – lets not kid ourselves). Lets take a closer look and see what the ZT 0350 is all about. WHile the 0350 is not as portly as it’s big brother, it still is not what I would call a “small knife.” The 0350 has an overall length of 7-5/8″ a 3-1/4″ blade and a weight of 6.2 ounces. So it’s still on the heavy side, and perhaps still too big for some to EDC, but if a sturdy good size folder is what you are after I don’t think it’s a huge issue. The blade is a modified drop point design. There is a small recurve and tons of belly. This is the same blade shape found on the 0300, just shrunk down slightly. I like how the tip has been left very strong. The tip of the 0350 has good piercing strength, and the high flat grind makes the knife excellent for slicing. While recurves can be a pain to sharpen, they really help feed material into the edge and are great slicers. ZT rounded things off by applying a beautiful edge and laser engraved hallmarks. This is a great blade shape a wide variety of applications. The steel on this knife is S30V, which is absolutely awesome stuff. I am a big fan of S30V because it holds a very nice edge for a long time, and is still reasonably easy to sharpen. S30V is also resistant to rust and corrosion. Zero Tolerance applied a very nice DLC (diamond like carbon) coating to the knife, which is about as durable as knife coatings get. In summary, this is a great blade shape made of great steel with a great coating applied to it. The ZT 0350 features a classic handle formulation – black G10 over very thick stainless steel liners. The handle has been meticulously finished – I absolutely love how everything lines up perfectly, and there isn’t a machining mark to be seen. As far as construction goes, everything is held together with torx bolts, and you have a partial G10 backspacer. My only suggestion for Zero Tolerance would be to mill out the liners a little to perhaps shave off a few tenths of an ounce. Really though, this handle is built like a tank and finished like a Swiss watch. The ergonomics on the 0350 are extremely satisfying. I wear a large glove and it feels like the knife was custom made for my hand. The width and thickness to the handle really fills the palm while the choil and thumb ramp prevent your fingers from slipping forward. The G10 has a medium level of traction, which is very pleasant feeling and offers good feedback. In reverse grip there is additional jimping for your thumb. All in all it’s a very comfortable and secure grip. The pocket clip is right out of the Kershaw parts bin and is simple, but effective. First of all, it’s unobtrusive with it’s flat black coating. It has excellent retention, which I find extremely important for a heavier knife – this means that the knife won’t slide around your pocket (or worse, fall out entirely). The fact that this is a true 4 corners clip (ambidextrous tip up or tip down carry) almost brings a tear to my eye. This is truly a well done pocket clip. Actual carry isn’t that bad. I found the knife is about as unobtrusive as 6+ ounces can get, although it’s certainly a change from say, my more typical 3-4 ounce EDC knives. For guys who regularly carry larger knives, I don’t anticipate any problems at all. The ZT 0350 gives you the option of either a flipper or thumb studs for deployment. In practice, only the right hand thumb stud is available (the left side sits too close to the handles) but my preference is for the flipper anyways. Either way the knife springs to life with very little effort due to the stellar Speedsafe assisted opening mechanism and high quality phosphor bronze washers. This is a knife that fires hard and fires fast. And on a tactical knife, this kind of easy of deployment can be the difference between life and death. If assisted opening knives aren’t your thing, it’s easy enough to remove the spring – deployment will be smooth regardless. Lockup on the 0350 is accomplished by a very beefy liner lock. This is a very well executed liner lock, and it bites in early with plenty of room for wear. One of the biggest differences between the 0350 and the 0300 is the absence of the titanium framelock, but I have just as much confidence in this very thick liner. It almost goes without saying, but I didn’t detect blade play in any direction. Zero Tolerance 0300 or Zero Tolerance 0350? A common question people have is whether they want the ZT 0350 or the larger ZT 0300. If you are one of those people, I made a video comparing the two knives. The Zero Tolerance 0350 is an absolutely outstanding knife. I love everything about it, from the choice of materials, to the incredible fit and finish, to the stellar design, to the great ergonomics, right on down to the excellent pocket clip. I am also very pleased to see that this knife is made in America and still comes in at a decent price. Currently these can be had for right around $100. When you consider how well this knife is made, I think it represents an excellent value – especially when the 0300 costs over $200. It’s been a real pleasure having this knife in my collection and it really makes me excited to review more Zero Tolerance knives in the future. The company really seems to know how to put together a great blade and am truly excited to see what they have coming up next. 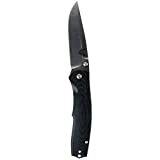 I recommend purchasing the Zero Tolerance 0350 at Amazon.com or BladeHQ. Purchasing anything through any of the links on this site helps earns BladeReviews a small commission at no cost to you, and keeps this review train running. As always, any and all support is greatly appreciated! It has been decided – I am a total sucker for a cool “gentleman’s tactical folder.” I remember first drooling over the 890 Torrent when it came out in 2009. Flash forward a couple years, and today I am the proud owner of my very own Torrent, a sleek Steigerwalt design made by Benchmade. As I said before, I am calling this one a “gentleman’s tactical folder.” In many ways this one reminds me of the Mcusta Tactility. It’s an elegant knife, and while I’m sure it could work well in a defensive role, this knife is just too pretty to really use and abuse. Also the build quality, while solid, simply isn’t meant for hard use tasks. I have no doubt this would hold up as an EDC blade, but as you will learn in my review – I don’t recommend this one as an all out tactical knife or hard use folder. Lets take a closer look to see what I am talking about. The Torrent has an overall length of 8.2″ a 3.6″ blade and it weighs 3.5 ounces. At this size the Torrent is light enough to EDC but large enough to be wielded as a tactical (emergency defensive) tool. Part of the reason why this knife is so light weight is because of the thin blade and liners. Benchmade says the blade is 1/10″ thick. Now I’m not complaining, the blade seems adequately thick for EDC, but I would be concerned about really testing the tip with repeated stabs and thrust cuts. Adding to the thin appearance is the swedge running the length of the drop point blade, and the thin flat grind. It’s a beautiful look but it doesn’t exactly inspire confidence when it comes to tip strength. The knife has been given Benchmade’s “satin finish” which appears to have a very light stonewash upon closer inspection. All in all it’s a really handsome blade with a good amount of functionality. Benchmade went with 154CM for blade steel, a very common choice for their knives. Personally, I’m a big fan of 154CM for it’s ability to sharpen easily, hold an edge, and to resist rust and corrosion. A good all-around steel, and hardened to between 58-61HRC, 154CM will accomplish most cutting tasks with ease. The handles on the 890 Torrent are smooth G10 and they cover full stainless steel liners. The G10 has a very attractive finish that resembles wood grain. It’s very similar to the finish on the scales of the Benchmade Onslaught and Deja Voo. The steel liners have not been skeletonized, but to me that isn’t a big deal since the knife only weighs 3.6 ounces. Everything has been bolted together and there is an aluminum backspacer doubling as a glass breaker (or “non lethal” option). Ergonomics on the 890 are fairly unremarkable. Don’t get me wrong, this handle is plenty big and comfortable, but there isn’t much in the way of a finger choil and there is no thumb ramp or jimping to speak of. Considering the overall build of this knife I’m not disappointed. Again, I see this as more of a gentleman’s folder with a tactical flair rather than an all out purpose-built tool. The G10 is smooth, but it isn’t slippery. The handle works well enough in forward and reverse grips, although I feel that some jimping on the spine wouldn’t hurt. The pocket clip is a sturdy piece of folded over stainless steel. It has been attractively finished and is set up for a nice deep carry. However, this is a right side tip down carry only. The absence of an ambidextrous clip is something of a deal breaker for for me since I am left handed. However, I actually like tip down carry with this knife because this is an assisted opening knife and it has a very light trigger. Carrying the Torrent tip up without an external safety would be an accident waiting to happen. The Torrent is an assisted opening knife and features Benchmade’s Nitrous Assist technology. This is my first real experience with a Benchmade assisted opener, and I was pleased with how fast and hard this knife fired. I was less pleased with the right side only thumb stud – again, it really limits my ability to carry this one. That said, the large thumb stud was easy to get at and I had no problem brushing this blade open with my fingers. The “trigger” is very light on this knife which makes it very easy to deploy. There is no external safety and I would not feel comfortable carrying this one tip up. To be perfectly honest, while I generally like spring assist knives I don’t think the Torrent needs to be spring assisted. If it was built heavier as a real folding tactical knife then the Nitrous assist would be more appropriate, but for a gentleman’s knife I think it’s overkill. The Torrent makes use of a liner lock and I found mine to engage nice and early with no blade play. That said, this looks to me like a thin lock and there isn’t much spring tension holding it in place. I found that the lock disengaged without much effort. I would seriously think twice before engaging in any kind of serious cutting tasks with this one. I don’t think it’s at the point where the knife is unsafe, but I don’t have as much confidence in it as with other liner locks. Of course, you want to be extremely careful with any folding knife – I just found lockup on the Torrent to be a little sketchier than I’m used to. I found myself immediately attracted to the 890 Torrent. The blade is a classic shape, lean and beautifully finished. The handles are simple, and flow gracefully with the lines of the blade. The fit and finish is top notch and I love the details like the jimped backspacer and polished pocket clip. Where the Torrent let me down was on the practicality of it. First of all, a right side only thumb stud and pocket clip is not going to work for me – that goes without saying. But more concerning was the overall light build of this knife. The blade steel is thin, as are the liners. The ergonomics are not aggressive and the lock seems very easy to disengage. While it’s a beautiful knife I really can’t recommend it for serious work. In my mind this one is ideally situated for the collector, or someone looking for an EDC knife with some tactical inspiration, a “gentleman’s tactical folder” if you will. Despite my gripes I’m still walking away liking the Torrent a lot. I know I may have been fairly critical with this one, but there is still a lot to like. This is great blade for the collection and I did enjoy carrying it despite it’s shortcomings – I just want to make sure that if you are interested in the knife, you are interested for the right reasons. I recommend purchasing the Benchmade Torrent from Amazon or BladeHQ. Please consider that purchasing anything through any of the links on this website helps support BladeReviews.com, and keeps the site going. As always, any and all support is greatly appreciated. Thank you very much. It’s been too long since I’ve examined a nice budget EDC blade. This time around I picked up a Kershaw Volt II, and could immediately tell that I grabbed a real winner. First off, the original Volt is a true collectors piece. It’s not a particularly old design, but it’s a limited edition titanium framelock with a composite steel blade – so it’s going to run you a few hundred dollars at least (if you can even find one). Kershaw went in the opposite direction with the Volt II. Here they opted for everyday affordability with nice, but inexpensive materials. The two blades do share a lot of similarities, as they are both creations from designer RJ Martin and have generally the same shape. The major differences are that the original Volt is much larger (1.75″ longer) and costs about 15 times as much as the Volt II. For right around $20 pretty much anyone can afford the Volt II, and to be honest I think you would be foolish not to. Lets take a closer look to see what I’m talking about. The Volt II has an overall length of 7″, a 3.125″ blade and weighs 3.4 ounces. This is a nice size for EDC and should be a fairly friendly looking carry regardless of where you live. The blade is a drop point shape, with a small swedge and nice sweeping belly. The entire blade has been bead blasted, which is familiar territory for a lot of Kershaw’s small EDC blades (like the legendary Kershaw Skyline). The tip on this knife is very good, holding a good amount of steel all the way to the very end. Kershaw finished this one off with a high hollow grind and a nice smooth edge. Blade steel is the very high value 8Cr13MoV stainless from China. My experiences with 8Cr13MoV have been very good. For the money, I really don’t think you can beat it. It is capable of taking a very nice edge and has good rust resistance. The Volt II features full stainless steel liners with injection molded plastic scales. The plastic is actually pretty dense (Kershaw calls it Polyimide) and I am quite pleased with it. An attractive triangle pattern has been emblazoned over the scales and the liners have been lightly milled out. I’m sure some would prefer G10, but for price I am not complaining. I really like how the liners have been given the same blasted finish as the blade – looks real sharp. Rounding things out is an almost full backspacer made of the same Polyimide material as the scales. Ergonomics on the Volt II are nice. First off, it is a smaller handle (~3.8″) so I found it slightly cramped with my larger hands. That said, I managed a full grip and liked how the thick and rounded scales felt in hand. There are two shallow choils and an integral guard to keep your fingers from slipping. A nicely jimped thumb ramp provide addition support on top. My only suggestion would be to make the handle a little longer to provide some extra room but I think for most people the ergonomics are going to work really well. The pocket clip is a kind of funky looking Kershaw clip. Having handled a number of Kershaw knives I’m no stranger to their somewhat unconventional clips. As you can see this one is quite interesting. In practice, the clip works just fine and is not nearly as funky as some of the others I have run into. I would have liked to have seen it be a little bigger, but it’s discreet and offers a low carry. On the subject of carry, this is a chunkier folder with a thickness of about half an inch. For some, this may be a little difficult to carry. I don’t mind it but everyone is different. One last thing to note is that this tip allows for tip up or tip down carry but it is right side only. The Volt II takes advantage of a nice flipper for deployment. This knife uses Kershaw’s Speedsafe assisted opening technology. This knife fires open hard with a really satisfying click. The flipper also doubles as a guard – a feature I have really come to appreciate with a lot of Kershaw designs. I’m also a big fan of the Speedsafe – Kershaw has done an excellent job with all of the assisted opening knives that I have handled. I predict that if you pick this one up you will spend way too much time playing with this one (at least I did). Lockup is accomplished through a liner lock. This is actually a pretty thick lock bar and it locks up nice and early on my example. I noticed zero blade play and I love how the knife has come perfectly centered. A small amount of jimping on the lock bar makes this an easy one to disengage when you want to, but it still feels very secure in hand. For EDC tasks this lock will be able to handle it all. Sometimes I get a knife in and the review just writes itself. I was impressed with the Volt II the moment it came out of the box, and I still haven’t put it down. If you want an EDC knife in the $20-25 this is a very strong option in my book. What really makes this one for me is the way it’s been put together. The fit and finish are phenomenal. The knife locks up nice and early, the blade is perfectly centered, deployment is smooth, the grinds are nice, the handle feels great – I could go on and on. To me this is a great example of what Kershaw does best – putting together a rock solid EDC folder that everyone can afford. My only issue would be that I’d like to see an ambidextrous clip and perhaps a slightly larger handle. Aside from that the knife has exceeded my expectations in every way. I want to note that the Volt II is made in China, but the quality control is excellent. I would put the level of fit and finish above my Spyderco Tenacious and wouldn’t hesitate to recommend this to anyone interested in the knife, or in need of an inexpensive folder that can take some real use. 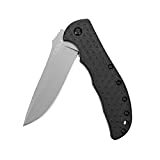 I recommend purchasing the Kershaw Volt II at Amazon or BladeHQ. Please consider that buying anything through any of the links on this website helps support BladeReviews.com, and keeps the site going. As always, any and all support is greatly appreciated. Thank you very much. The term “aegis” has ancient roots. Commonly used in Greek mythology, aegis means “protector” and has been often symbolized in the form of a shield. In many ways the SOG Aegis is emblematic of a protector as well. If ever needed the Aegis could certainly offer its user security – be it helping in some emergency utility task. or perhaps by performing in a more tactical role. While the knife was not imbued with any mythical powers, the light weight and wicked blade are quite enchanting, and are among many reasons to consider adding this knife to your collection. The Aegis has a 3.5″ blade, an overall length of 8.25″ and a weight of 3.1 ounces. This is a medium sized folder and depending on who you are, could be on the larger side for EDC. The weight of only 3.1 ounces is exceptionally lightweight so if carrying a bigger blade appeals to you this is a good option. The blade on this knife is a long leaf shape and comes with a plain (non-serrated) edge. Made from 1/8″ stock this blade terminates with a needle sharp tip. Seriously, the tip on this thing is incredible. The full flat grind and absence of a swedge enhances this feature and the blade shape is excellent for thrust cuts and piercing. However, you will want to be careful with prying or stabbing into hard materials as the unenforced tip could break. This isn’t necessarily a negative, you just want to bring the right tool for the job. If prying is your modus operandi go to the hardware store and pick up a crowbar. The edge came absolutely razor sharp with a beautiful job done on the grinds. As an emergency tactical knife I think this blade shape is highly effective. For EDC tasks there is ample belly and great slicing capability with the full flat grind. As you can see in the photographs, you have a couple different options for finishes. Shown here are the satin finished blade (with matching silver hardware) and black titanium nitride (TiNi) coated versions. Both are beautifully done. I love the satin finish SOG puts on their knives, but the TiNi coating wins points for hiding finger prints and the general “stealth factor”. I have found the coating to be very durable – this isn’t some inexpensive coating that will rub off. It will wear with use, but expect it to hold up favorably to cheaper painted teflon coatings. The Aegis comes in AUS8 stainless steel – a very nice mid range Japanese stainless steel. I love the keen edge AUS 8 takes and the ease of sharpening. I haven’t noticed any issues with rust and the steel resists chipping. SOG cryogenically heat treats their AUS 8 which provided enhanced toughness and better edge retention. I think AUS8 was a good choice and SOG really knows how to work with this steel. Like the Flash II, the Aegis has a glass reinforced nylon (GRN) handle and lacks metal liners. The GRN on the Aegis is of high quality and feels good (not cheap and plasticy). This is a closed back design. Due to the absence of liners, it’s a very lightweight handle. The ergonomics of the Aegis is also very nice. With a 4.75″ handle there is plenty of room for my larger hand and it naturally offers a comfortable 4 finger grip in both forward and reverse positions. I love the flowing lines of the handle, it fills the hand and provides great visual balance. Grip has further been enhanced with “digital” texturing and all the corners have been smoothed and rounded. SOG embedded rubber inserts into the handles which provide extra feedback and grip. Additionally, the back of the handle and spine of the blade have been given some jimping. Oddly, the jimping faces towards the tip but it does offer grip (especially the TiNi version – I think the satin finish has rounded the “bite” off just a little). Personally, I think it would offer more grip if the jimping was oriented in the opposite direction, but the current configuration does provide some traction. The choil area has been given some texturing, a sort of enlarged jimping or “scalloping” if you will. This helps lock the index finger in place and provides more tactile response. All in all I love the ergonomics on the Aegis – it’s obvious a lot of time was put into designing the handle. The pocket clip is SOG’s bayonet style clip. The clip allows for ambidextrous tip up carry, rides ultra low, and provides excellent retention. “SOG” has been cut into the clip, which I don’t mind, especially on the blackened version. All in all it’s a discrete carry. Like many of SOG’s folders, the Aegis is an assisted opening knife. The spring on the assist is very good at shooting the blade out with a satisfying snap. The thumb studs are large and ambidextrous. It’s easy for me to get my thumb behind the stud and the knife flips out effortlessly. Lockup is done through SOG’s Arc lock. This style of lock is similar to a Benchmade Axis lock or the ball lock found on the Spyderco Manix 2. It is essentially a type of bolt lock. It’s a secure design that can be easily engaged. Lockup is quite secure on both of my Aegis knives with a microscopic amount of bladeplay in one and none in the other. This is a great accomplishment from a linerless design, and I was really impressed with how tight these knives locked up. One minor complaint (or wish perhaps?) would be to get the arc lock positioned on both sides. I know SOG does this on some of there more expensive folders, and would probably drive the price up (while providing a diminishing amount of utility). As a left handed user it would make the knife easier to close with one hand. Also, like many of SOG’s assisted openers, there is a built-in safety. The safety is a nice option and I believe it’s part of the reason why SOG can offer this knife in tip-up carry (my preferred form of carry). I have really enjoyed owning both of my Aegis’s (Aegi?) and believe that they could live up to their namesake. Whether it’s helping you build shelter from a storm, or working as a tactical knife, the light weight and smart design is an excellent blend of form and function. And I have to admit, I love the form aspect of this knife. This is an awesomely balanced knife combining a big blade, fast deployment, robust lockup with a light and easy carry weight. Fit and finish is excellent, and the price (around $50) provides a lot of quality knife for your money. 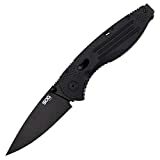 I recommend purchasing the SOG Aegis at Amazon or BladeHQ. Please consider that buying anything through any of the links on this website helps support BladeReviews.com, and keeps the site going. As always, any and all support is greatly appreciated. Thank you very much. In my opinion the wharncliffe is one of the most under-appreciated blade shapes out there. Many may write the shape off as a novelty, but in my experience a wharncliffe blade can be incredibly useful for a lot of every day tasks. That’s why I wanted to make sure I eventually got down to reviewing one of my favorite production knives with a wharncliffe blade, the Kershaw Needs Work. At first glance this knife appears to be more at home on the set of an “Aliens” sequel than in your pocket. This is another Ken Onion design, and one of his more radical blades. I’ll admit, the look of the Needs Work had to grow on me a little, but I quickly warmed up to it. Today I really like the looks of this knife and the performance as well. I think Ken and Kershaw did a great job representing the “wharnie” here. To provide a little context, I would mainly classify this as a utility knife. That is, a knife that is used to cut a lot of boxes, leather, carpet, etc etc – a dedicated work knife for your shop or tool box, or to be carried while working a physical job with a lot of cutting tasks. The wharncliffe shape essentially provides a 3 inch razor blade, and the fine tip allows for unmatched precision. I am hesitant to classify (or recommend) this as a full blown EDC knife, mainly because it doesn’t carry particularly well. However, it all boils down to what you want to use the knife for. The Needs Work has a 3″ blade, a 4 1/8″ handle and weighs 3.5 ounces. This is a stout little folder designed for light and medium duty use. As you are well aware by now, the NW has a wharncliffe shaped blade. The NW’s blade is .12″ (3mm) thick – this is a thick piece of metal for a small folding knife. From a design standpoint, Ken Onion gave this blade some of his characteristic flair. The blade includes gentle sloping curves and a nice little swedge. It’s a simple design that I really like. A hollow grind begins about half way down the blade. The tip on this knife is exquisite, and will let you make very precise cuts. If you go through a lot of boxes, or cut stuff like carpet I highly recommend this blade shape. The angled handle only accentuates this feature. On the flip side, the fine tip means it could break – if you do a lot of thrust cuts or want a “hard use” knife I’m not sure the tip will hold up. My Needs Work came with that gray matte finish popular on a lot of Kershaw knives (like the Skyline). You may also be able to find this knife with a black titanium nitride coated blade as well. Kershaw went with Sandvik 14C28N stainless steel for the blade here, a steel I am very familiar with. It holds a very nice edge and sharpens easily. My only advice would be to keep an eye out for rust, I’ve noticed a couple small spots form on my Skyline. The Needs Work has a beefy handle with glass-filled nylon scales over full stainless steel liners. The thick handle offers good grip, but makes the knife a little harder to carry. The scales have been given a really unique pattern. It’s got a kind of organic alien looking vibe to it. I am not crazy about the pattern, but it’s not really seen as a negative either. There is a full backspacer and the liners have not been milled out. The ergonomics on the Needs Work are pretty good. I noticed a lot of people raving about the ergos, but I found the handle to be a little small for my relatively large hand. I can squeeze all 4 fingers on the grip, but realistically, this is a 3 finger knife for me. It’s still a comfortable knife but my pinky does feel a little lonely there. The thumb ramp and choil are well defined and there is adequate jimping on both. The thick handle does feel good and the textured pattern provides some response. For some reason I really like throwing the NW into a reverse grip; the handle is well suited for it. Perhaps the biggest ergonomic feature is the angle of this handle. This allows you to take full advantage of the fine tip. The Needs Work could be a great knife to cut dry wall, carpet or similar flat materials. I found it to be very convenient when I had to trim some posterboard for the background on my little photography studio. More conventional blade shapes (and handle angles) would make you rotate your wrist further to use the tip of the blade for precision cuts. The Needs Work is a much better design for those kinds of tasks. Sadly, the pocket clip is something of an abomination. Right off the bat, you are limited to right-side tip-down carry only. Furthermore, the large (ugly) clip rides high in the pocket, adding insult to injury. In practice, I actually found the tip down carry to be OK given the flipper and assisted open. I’d much rather see some mounting options and a little more conventional looking clip. The clip and thick handle are the two main reasons why I am hesitant to recommend this as an EDC blade. Deployment on the Needs Work is awesome. This is a speedsafe assisted opening knife, and the spring on this the NW shoots the blade of this knife out like a gun. This is a wicked fast deployment that makes an awesome cracking sound as the blade locks open. This is one of my favorite assisted openers; the cool blade shape and rapid deployment are too much fun. Opening is only accomplished through the flipper – not an issue here at all. Lockup on the Needs Work is equally impressive. The NW uses a very interesting liner lock that requires no stop pins. The tang of the blade locks into the liner at two different places. It’s hard to describe but very solid in practice. There is zero blade play in this knife, which is awesome when you consider how much force this lock is put under by the assisted opening. I really like this one. The unique blade, the chunky design, the lightening fast deployment and super solid lockup – these are all major plusses. Also, I found the wharncliffe blade to be uber useful. That tip allows you to do detail cuts like no other knife. I also love how the Needs Work was made in America, and can be found for right around $30. Also, the fit and finish on mine is great. Blade centering is perfect, the grinds are smooth and even – everything was well put together. This is a knife I am proud to add to my collection. That said, I do ding the knife a little for it’s pocket clip – that’s my only real issue here, and to be honest it still carries pretty well considering. If you want a rugged utility knife, or are searching for something a little different I recommend the Needs Work. 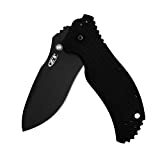 I recommend purchasing the Kershaw Needs Work at Amazon or BladeHQ. Please consider that buying anything through any of the links on this website helps support BladeReviews.com, and keeps the site going. As always, any and all support is greatly appreciated. Thank you very much. SOG is a company that has always intrigued me. They have eschewed the more mainstream model of production knife design, which typically involves a team of in-house designers and a deep roster of freelancers, instead favoring a one man approach. All of SOG’s knives are designed by president and founder Spencer Frazer. This has resulted in some unique design elements and ultimately, some very unique knives. The Flash II is a shining example of this, a knife that is quintessentially SOG and decidedly different. This blade has been around the block a time or two (it’s been in production for years), and has passed through the hands of thousands in its various iterations. Today I turn back to the classic drop point version with a plain edge and black handle. For purposes of this review, I am classifying the Flash II as a medium sized EDC and emergency tactical knife. With it’s big blade, grippy handle and assisted opening, the Flash II could easily fill an emergency tactical role. Also, due to the number of different finishes and handle choices available, this could very well be a collectable for fans of the brand. The Flash II has a 3.5 inch blade, and overall length of 8″ and a weight of 3.1 ounces. Going back to the purpose of this knife, I think the combination of the long blade and light weight make it an interesting emergency tactical option. It also could be practical for EDC if you like a bigger blade but don’t like being weighed down (the Flash I is a smaller version, perhaps more appropriate for EDC). The blade shape is a very traditional looking drop point. It’s a no frills design with a full flat grind (“FFG”). As something of a traditionalist, this simple style of blade always appeals to me, and the FFG is great for slicing. My Flash II came with a very nice satin finish and a meticulously ground secondary bevel. The satin finish is a finger print magnet, and I find myself constantly wiping this knife down… That probably says more about me than the knife, but it’s something I noticed. Of course, as one of SOG’s classic models this knife comes in a couple blade shapes (wharncliffe, tanto and the drop point version shown) and you can also get this blade with a Titanium Nitride (TiNi) coating and some even with tiger stripes. SOG selected AUS8 blade steel for the Flash II. If you are into steel then you already know about AUS8, it’s a mid range Japanese steel. If you aren’t that into steel, then know that AUS8 takes a sharp edge and holds it pretty well. It’s easy to sharpen and very forgiving. SOG does a cryo treat on this blade which is supposed to improve toughness. I find AUS8 to be entirely adequate and fits the mid range price tag well. Ergonomics on this oddly shaped handle are surprisingly good. It’s a chunky design and has no problem filling the hand. The corners have been slightly rounded. For normal use it’s comfortable, and even when holding the handle tightly and carving off long curls of wood it wasn’t that bad. I wouldn’t want to build a tree fort with this knife, but for most tasks I’d say the handle works well. I do like the thumb ramp and dual choils. They help provide control for detail work. The sides of the handles have been given a diamond texture and help with overall grip. The pocket clip is an ultra deep carry design and is reversible. It’s a tip-up only clip and provides strong retention. It’s kind of a funky looking, definitely another look distinct to SOG. There is also a very small lanyard hole next to the clip. The Flash II has an assisted opening. A gentle push on either of the ambidextrous thumb studs snap the blade out in a “flash.” Stupid puns aside, the opening is quick and smooth. Assisted openings can be a matter of taste, but I like it on this knife, especially as an emergency tactical folder. Rapid fool-proof deployment under stress is what I’m looking for an an emergency tactical blade, and the Flash II provides just that. There is a safety lock on the side of the handle. When the safety is engaged it prevents accidentally opening the knife. For many this will be about as useful as a sock on a chicken’s foot, but it allows SOG to make this assisted opener a tip-up carry knife so I don’t mind. I just leave mine in the “off” position and go about my day. The Flash II uses what seems like a combination between a bolt lock and a lock back. It’s hard for me to really tell without taking the knife apart, something I’m not quite ready to do. I found that there was some side-to-side play when I had the blade open and locked. I tried adjusting the pivot, and was able to fix it somewhat, but there was still play evident in the blade. Given that this is a linerless design, with what appears to be some sort of bolt lock, I am not really surprised by this. If there was up-and-down play (there wasn’t) I would be concerned as that would suggest that the lock could fail. If you can live with a little side-to-side play in your knife then I don’t see this as a major issue. If blade play is something you can’t stand, or want to really hard use this knife, then keep this in mind. All in all I am very happy with the Flash II. I love the blade, can appreciate the light carry, and find the assisted open to be both fun and practical. It’s a quirky little knife that really stands out in a crowd. As a fan of choices I think this is a good thing. The only real negative I could find was the blade play. I’ve done some reading and know I am not alone, but that doesn’t stop this from being a classic folding knife enjoyed by many. If you want something lightweight, practical and a little different, then I suggest checking out the SOG Flash II. 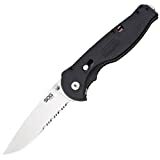 I recommend purchasing the SOG Flash II at Amazon or BladeHQ. Please consider that buying anything through any of the links on this website helps support BladeReviews.com, and keeps the site going. As always, any and all support is greatly appreciated. Thank you very much.